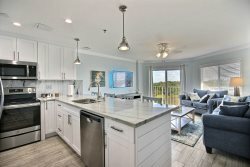 Instantly feel the warmth of the island spirit as you enter this inviting 3-bedroom, 3-bath, tri-level townhouse at Mariners Club Resort. Enjoy the relaxing atmosphere the Florida Keys are known for...a perfect setting for family fun or a private romantic get-a-way. Experience the joyful gratitude of the day's offering of a sunrise from your screened lanai with that ever-so-welcoming cup of morning coffee. An open floor plan on the second floor...which is the main living floor...affords a comfy living room setting to kick-back with a good book or a fun family movie...or how about bringing back the good-old-days with the family around the dinner table with comfortable seating for 6 and room for 2 more at the breakfast bar. The gourmet kitchen with granite countertops has top-of-the-line appliances that make any meal easy and fun to prepare! The kitchen has a large pass-through which is perfect for entertaining kitchen-to-dining. A small guest bedroom on this level features a triple-bunk...one that has a full-size bed on the bottom and a single bunk on top that sleeps 2-3. A guest bedroom on the 3rd floor offers a queen-size bed, TV and a full ensuite. The master bedroom is also located on the 3rd floor and touts a king-size bed, a private screened patio and a spectacular view of the oasis pool and the Atlantic Ocean. An elegant sunken spa tub is the highlight of the ensuite and also includes a separate shower and his-n-hers granite-topped sinks. Unit sleeps 6-7 in beds and allows a maximum occupancy of 8. NOTE: 3-7 day stay requirement varies by time of year. No arrivals on Christmas day.. Very friendly and helped give us information about the area we stayed. The resort has nice amenities and very affordable. The furniture is older and could be replaced or use a good steam cleaning. MGR RESPONSE: We will address the furniture cleaning concerns quickly! Thank you for your feedback. Very easy to deal with. We checked in after hours and it was very easy to get our keys with directions to the condo. Cant wait to do it again. The team is very nice, will always rent with barefeet rentals! Our stay was perfect for a long weekend! I would probably buy non-stick kitchen items! Over than that this condo had all the amenities you would need! Loved the fact it had a Keurig also!Beautiful weather helped! The atmosphere is so relaxing! We cook breakfast and eat lunch at condo, always eating out in the evening at some of our favorite places! Always look forward to our trip to the Keys in February! When you're from Michigan & Ohio this is a perfect place to interrupt old man winter for awhile! We found everyone to be professional and friendly, especially when we needed after hours assistance. The house was spotless, very clean. We loved the property amenities (pool, hot tub, etc) and loved the location of the property. It was a wonderful stay! This was our second time booking with Barefeet rentals and your agent are great. Very friendly and knowledgeable. We love the Walk in pool for our grandkids, also for myself to get used to the water (I'm a freeze baby). VISIT JOHN PENNENCAMP STATE PARK TO SNORKLE WITH THE UNDERWAYER STATUE OF CHRIST...An absolute must see!